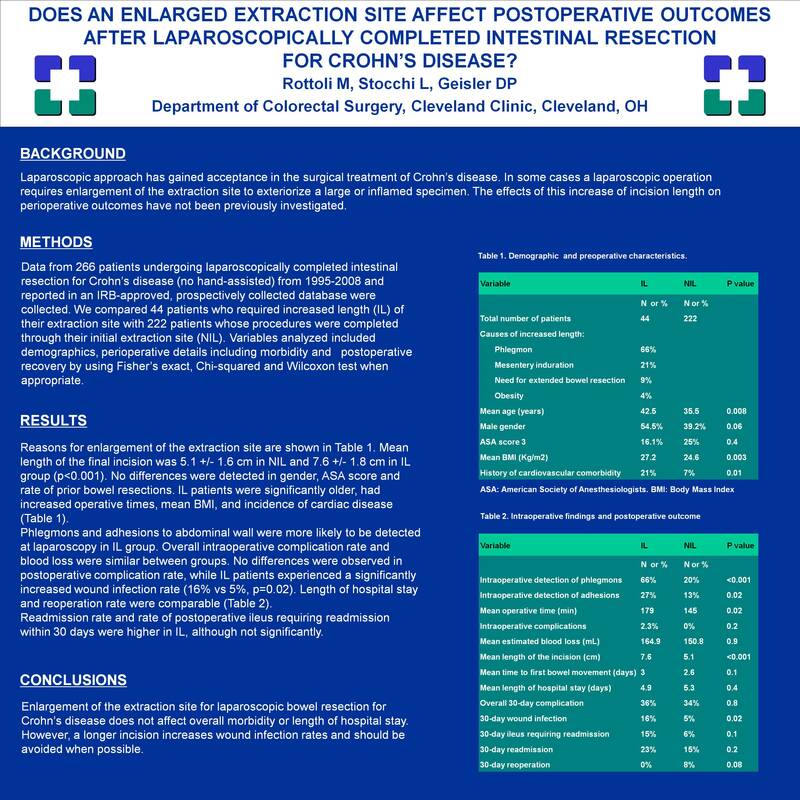 Does an Enlarged Extraction Site Affect Postoperative Outcomes After Laparoscopically Completed Intestinal Resection for Crohn’s Disease? BACKGROUND: Laparoscopic approach has gained acceptance in the surgical treatment of Crohn’s disease. In some cases a laparoscopically completed operation requires enlargement of the extraction site to exteriorize a large or inflamed specimen. The effects of this increase of incision length on perioperative outcomes have not been previously investigated. MATERIALS AND METHODS: Data from 266 patients undergoing laparoscopically completed intestinal resection for Crohn’s disease (no hand-assisted) from 1995-2008 and reported in an IRB-approved, prospectively collected database were collected. We compared 44 patients who required increased length (IL) of their extraction site with 222 patients whose procedures were completed through their initial extraction site (NIL). Variables analyzed included demographics, perioperative details including morbidity and postoperative recovery by using Fisher’s exact, Chi-squared and Wilcoxon test when appropriate. RESULTS: Reasons for enlargement of the extraction site were size of phlegmons (66%), mesentery induration (21%), extension of bowel resection (9%) and obesity (4%). Mean length of the final incision was 5.1 +/- 1.6 cm in NIL and 7.6 +/- 1.8 cm in IL group (p<0.001). No differences were detected in gender (p=0.06), ASA score (p=0.4) and rate of prior bowel resections (p=0.4). IL patients were significantly older (42.5 vs 35.5 years, p=0.008), had increased operative times (179 vs 145 min, p=0.02), mean BMI (27.2 vs 24.6, p=0.003), and incidence of cardiac disease (21% vs 7%, p=0.01). Phlegmons (66% vs 20%, p<0.001) and adhesions to abdominal wall (27% vs 13%, p=0.025) were more likely to be detected at laparoscopy in IL group. Overall intraoperative complication rate (p=0.2) and blood loss (p=0.9) were similar between groups. No differences were observed in postoperative complication rate (36% vs 34%, p=0.8), while IL patients experienced a significantly increased wound infection rate (16% vs 5%, p=0.02). Length of hospital stay (4.9 vs 5.3 days, p=0.4) and reoperation rate (0% vs 8%, p=0.08) were comparable. Readmission rate and rate of postoperative ileus requiring readmission within 30 days were higher in IL, although not significantly (23% vs 15%, p=0.18 and 15% vs 6%, p=0.1, respectively). CONCLUSIONS: Enlargement of the extraction site for laparoscopic bowel resection for Crohn’s disease does not affect overall morbidity or length of hospital stay. However, a longer incision increases wound infection rates and should be avoided when possible.